Waggo Blog : New Ceramic Dog Bowl and Treat Jar - Splash! What’s black and white with treats and food all over…or inside? Our newest dog treat jar and dog bowl design of course! Take a look at our classic ceramic dog bowl and ceramic dog treat jar with a whole NEW splashed design. We like to make it easy to coordinate around here. Take a peek at our Splash Treat Jar and Bowls here. Just like our classic dipped dog treat jars, the cork topped treat jar will keep your pups treats or cookies fresh and crunchy as long as needed. You might even start storing your own food in there for freshness! Your secret is safe with us, we won’t tell. The treat jars are 5 x 4 which is the perfect size for you or your dogs treats. Not to worry, both the treat jar and dog bowl are also dishwasher safe, microwave safe and FDA approved for human use if your dog let’s you borrow his new favorite bowl. The bowls have a 4 cup capacity to fit your dogs favorite noms and measure 2.75″ x 6.5″. Our medium sized bowl and treat jar are both 100% ceramic and make a great set. They’re a perfect holiday gift for your pals who love classic black and white-which never goes out of style by the way. They are also sold separately to mix and match from our other collections to fit your unique home style. 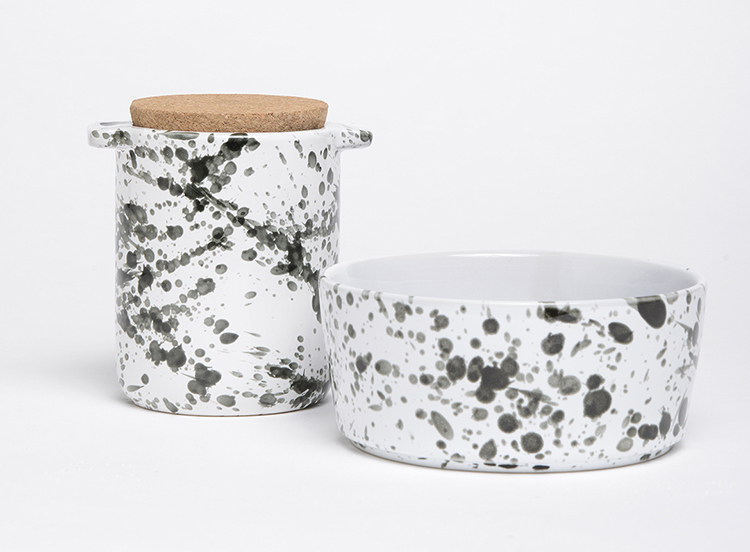 The simple yet bold design of our new splash dog bowls and treat jars will look great in your kitchen or living room. Previous post:Get Ready for the Holidays! 1 Day Only – 30% Off! Next post:Nice to Mat You, Pop Plush Mat “Lambskin” Dog Bed!